The Skinny: Those watching this for Michelle Yeoh will be disappointed by her flower vase character. Those watching this for a satisfying cinematic experience will also be disappointed because this movie is not very good. by Kozo: This subdued action comedy stars Sammo Hung and George Lam as a couple of thieves who become reluctant partners. Both Owl (Lam) and Dumbo (Hung) have since left their illicit field, but both are called into service when they’re blackmailed for their individual crimes. 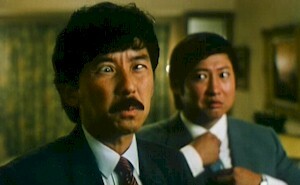 Their mysterious benefactor/tormentor is Chung (Stanley Fung), a fed-up cop who wants to use our two heroes to bring down a gangster (James Tien) who Owl once stole from. Why Chung decides to use Owl and Dumbo isn’t fully understood - nor are Chung’s reasons for sending Owl and Dumbo into the employ of Miss Leung (Deannie Yip), a social worker who makes them help juvenile delinquents find jobs. That last plot device also introduces us to Miss Yeung (Michelle Yeoh), another kindly social worker who lets the juvenile bastards walk all over her. What that has to do with anything is beyond me, but Owl and Dumbo take the time to help the kids find self-respect and hope for themselves in what has to be the most hackneyed To Sir with Love rip-off in the history of cinema. Quite frankly, I didn’t dial up this movie to watch really terrible young actors emote about their lives as underage hookers. If it was supposed to touch me then it failed with a capital F.